We are located approximately 60-90 minutes northwest of Minneapolis/St Paul, just nine minutes off Interstate 94, and are 15 minutes west of St. Cloud. From I-94 take the Hwy 23 exit (number 164) and travel west on Hwy 23. 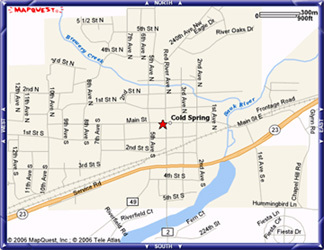 At first set of stoplights upon entering Cold Spring, go right on Main Street. Follow through town, staying on Main Street through next set of lights, and The Pillar Inn is up the hill one block on your right. We are across the street from St. Boniface Catholic Church.